I can't believe I am done with Day 6 of the 30 Paintings in 30 Days challenge and it isn't close to midnight! 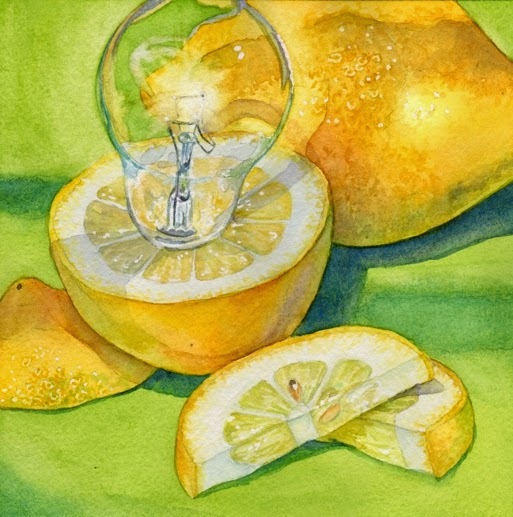 My painting is titled, "Lemon Light". Today's painting was enjoyable because of the subject, but also the analagous color scheme. For those that may not know, an analagous color scheme is one where all the colors are next to each other on the color wheel. In this case - yellow, green, and blue are analogous. I created the green in the background by mixing Cobalt blue and Aureolin yellow. This is one of my favorite green mixes. I know this looks like the same painting twice, but after looking at it, a couple hours after finishing, I decided that the green wasn't vibrant enough. So, I taped by painting back down and using a mix of Green-gold and Cobalt blue I did a wash of bright green over the background. It is a good thing I had signed the painting with a waterproof pen because I was able to paint over my signature without a problem. 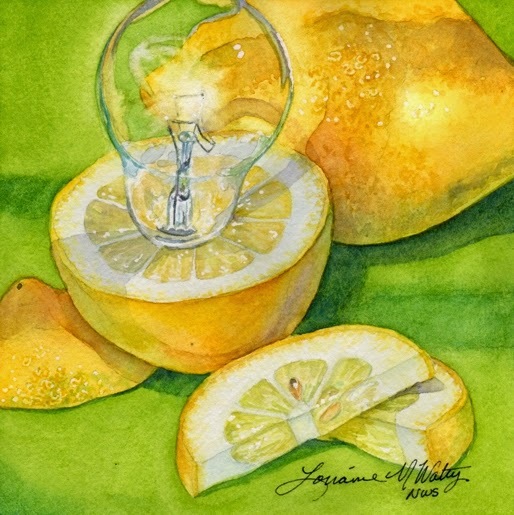 "Lemon Light" is a 6"x6" watercolor and it is available for purchase on Daily Paintworks for $90 - Click here to purchase.